Cystic diseases of the liver are relatively common conditions and are most commonly identified incidentally on routine imaging. However, in rare cases they can be complicated and life-threatening. In this article, we will discuss the varying types of cystic liver disease, their investigation, and management options. Simple liver cysts are simple fluid-filled epithelial-lined sacs within the liver, most commonly occurring in the right lobe. They are relatively common, with a prevalence of 2.5-18%, increasing in incidence with age. They are thought to be due to congenitally malformed bile duct cells, failing to connect to the extrahepatic ducts, which leads to a local dilatation filled with a bile-like fluid, of varying size. Simple cysts are normally asymptomatic and often detected incidentally on imaging. Around 10-15% of patients experience symptoms* such as abdominal pain, nausea, and early satiety (typically due to mass effect on surrounding structures). LFTs are typically normal, although a small number of patients may have a raised GGT. Tumour markers CEA and CA19-9 can also be elevated in some cases. Ultrasound remains the imaging modality of choice for investigating suspected liver cysts. Simple cysts are characteristically anechoic, well-defined, thin-walled (often imperceptible), oval/spherical lesions with no septations, and strong posterior wall acoustic enhancement. Most cysts require no intervention, though for cysts >4cm in size, follow-up ultrasound scans are recommended at 3, 6 and 12 months post-detection to check for growth. If the size of the cyst remains unchanged after 2-3 years, no further scans are required unless the patient becomes symptomatic. If the patient is symptomatic or the diagnosis is uncertain, further intervention may be warranted. Options include ultrasound-guided aspiration or laparoscopic de-roofing*, with the latter having lower rates of failure and recurrence. Polycystic liver disease is characterised by the presence of ≥20 cysts within the liver parenchyma, each of which are ≥1cm in size. Caused by mutations in the PRKCSH (chromosome 19) or SEC63 (chromosome 6) genes; patients with this genotype will not have any renal involvement. Mutations in these genes result in aberrant ductal plate configurations during liver embryogenesis. Importantly, these structures are not connected to the intrahepatic bile ducts and so do not drain, leading to dilatation and eventual cyst formation as they progressively fill with bile-like fluid. The majority of patients are asymptomatic, symptoms only arising as a result of localised compression or complications. In those symptomatic, patients will often present with abdominal pain as the cysts grow in size and hepatomegaly being present on examination. Any concurrent renal disease may also present with additional urinary tract symptoms. Significant disease can eventually cause liver cirrhosis and portal hypertension. Most patients will have normal LFTs (ALP can become raised in a small proportion); renal function can be affected in those with renal cysts too. Asymptomatic cystic disease can be left alone and monitored, though many patients will eventually require some form of intervention due to its progressive nature. Some trials have demonstrated the short-term benefit for somatostatin analogues in symptomatic relief (acting to reduce cyst volume). Indications for surgery for cystic liver lesions are (1) intractable symptoms (2) inability to rule out malignancy on imaging alone (3) prevention of malignancy. True cystic neoplasms of the liver are rare and account for <5% of liver cysts. Most common subtype are cystadenomas (non-invasive mucinous cystic neoplasms). These are premalignant lesions, developing as a result of abnormal proliferation of biliary epithelium and can undergo malignant transformation into cystadenocarcinomas in around 10% of cases. As with other hepatic cysts, patients are commonly asymptomatic. Cystic neoplasms grow slowly, typically 1-2mm per year and if symptoms do develop, they may do so insidiously. For symptomatic individuals, common symptoms include abdominal pain and anorexia, as well as more vague symptoms of nausea, fullness, and bloating. LFTs are often normal, although ALP, CEA, and CA19-9 can all become mildly elevated. Ultrasound scanning will often be able to differentiate between simple cysts and more complicated cystic lesions. 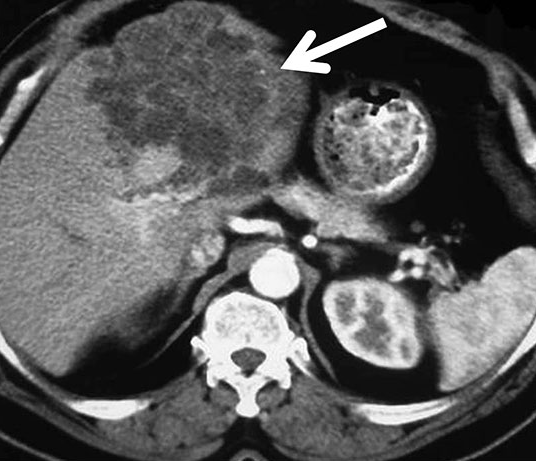 CT imaging with contrast should be performed on all patients in whom a cystic neoplasm is suspected for further delineation +/- evidence of metastasis. Aspiration or biopsy should be avoided if a cystic neoplasm is suspected as this can result in potential peritoneal seeding of the malignancy. 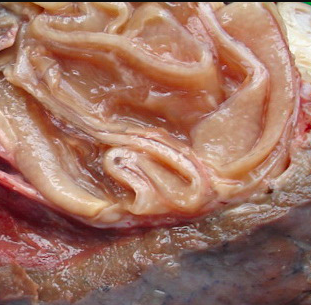 Liver lobe resection is the treatment of choice for both cystadenomas and cystadenocarcinomas, with the samples only then sent for histopathology to confirm the diagnosis. Hydatid cysts, or Echinococcal cysts, result from infection by the tapeworm Echinococcus granulosus. The eggs as passed by faceo-oral transmission. After being excreted by carnivores (commonly from dogs), the larvae invade their hosts’ gastrointestinal tract, before passing via the hepatic portal system into the liver, where they continue to grow and form cysts. Echinococcal disease has a global distribution, though the highest prevalence is in South America, North Africa and Central Asia. Cysts may only grow at a rate of a couple of millimetres per year. As a result, they can remain asymptomatic and undetected for many years. The most common presenting symptom is vague abdominal pain, caused by mass effect on surrounding structures or due to rupture. The disease can also result in jaundice or cholangitis (if the biliary system is involved), vomiting, dyspepsia and early satiety or rarely anaphylaxis if the cyst ruptures into the thorax or intraperitoneally. LFTs are often normal, unless presenting with a cholangitis picture. FBC can show an eosinophilia. Echinococcal antibody titres are positive in 80% of those with the disease. Ultrasound scanning will reveal a calcified, spherical lesion with multiple septations. It may be anechoic or containing snowflake-like inclusions. Further assessment can be performed via CT imaging with contrast. Aspiration is not recommend in those with suspected hydatid cysts as rupture may cause an anaphylactic reaction. If cysts are asymptomatic and inactive, it may be possible to monitor them. The primary treatment is surgical with cyst deroofing. 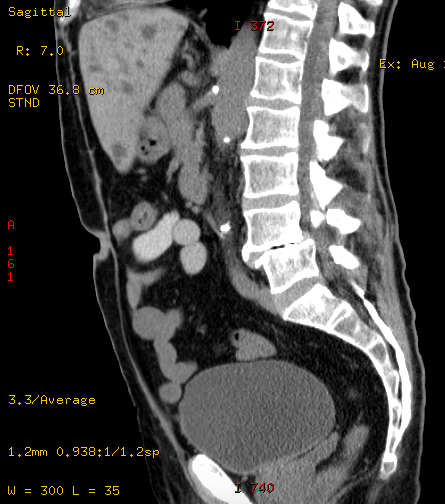 Radiological drainage and injection of scolecidal agent (the PAIR technique) is also an option in specialist centres. Medical management is used as an adjunct to surgical therapy, in those with widely disseminated hydatid disease or in patients who are unfit for surgery. For patients in whom active treatment is indicated, anti-microbial action varies however a combination of albendazole, mebendazole and/or praziquantel is normally given. What are the four anatomical lobes of the liver? Which one is not true about simple hepatic cysts? What are the two most common causes for polycystic liver disease? What is the most common subtype cystic neoplasm of the liver? What is the route of transmission for Echinococcus granulosus, the causative agent for hydatid cysts?